Named officers for 2019 with Chester Arbor of the Gleaners Life Insurance are standing, from left: Jim Osborn, Chaplain; Deb Noll, vice president; Linda Ruehrmund, publicity; Rita Barton, president. Seated is Marilyn Davis, secretary/treasurer. Officers with Chester Arbor of the Gleaners Life Insurance were recently named and will lead the next biennium. Named president is Rita Barton, who will lead the outreach of activities in the area. Deb Noll is vice president; Marilyn Davis, secretary-treasurer; Jim Osborn, chaplain and Linda Ruehrmund, publicity. 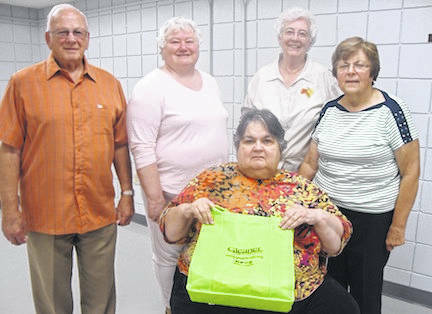 Twenty five members recently met at the Mount Gilead Library to select three Outstanding Community Reward recipients and to overview the calendar which was proposed for 2019. The Arbor welcomes anyone who is interested in giving back to the community as well as creating special friendships. More information can be found by calling 419-864-7520.